Every savvy trip planner should have Groupon added as a favorite in their internet browser. If you haven't already, you must sign up so you can receive their deals in your e-mail inbox! Screenshot of 03/19/14 deal to Ireland. Sometimes instead of creating and planning your own trip, you might want to consider a package deal that includes airfare, lodging, some (or all) meals, and entertainment -- but do so without it being grossly expensive. Groupon's Getaway deals cover all parts of the globe at pretty affordable prices! Did St. Paddy's day put you in the mood to visit Ireland? 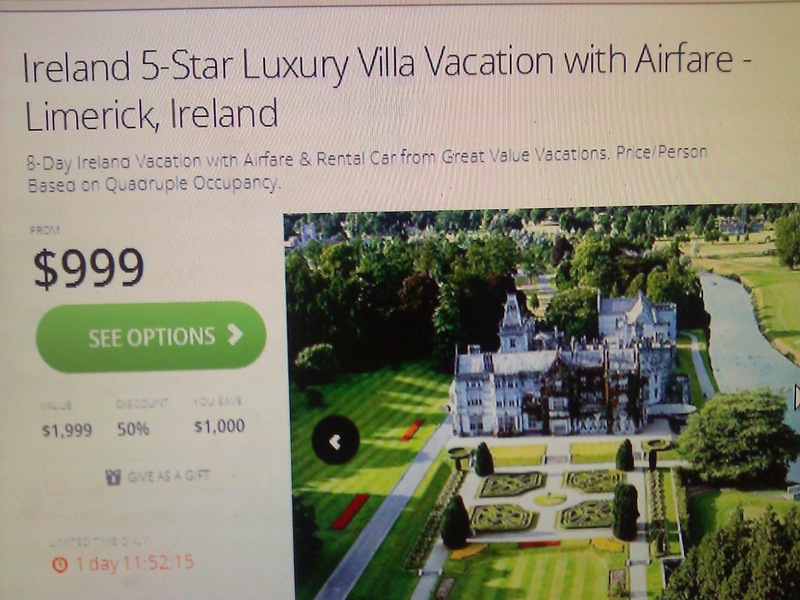 Check out their $999 deal to stay in Ireland for eight days! But hurry fast, because this deal is only offered through the end of the day. Or maybe you're in the mood for a warmer clime? A four night stay for two in the Dominican Republic at an all-inclusive resort could be managed at deeply discounted prices if booked through Groupon. As with any purchase, be sure to read the fine print and understand exactly what you're purchasing. There may be restrictions as to what times of the year you may visit or an expiration date on the deal itself.